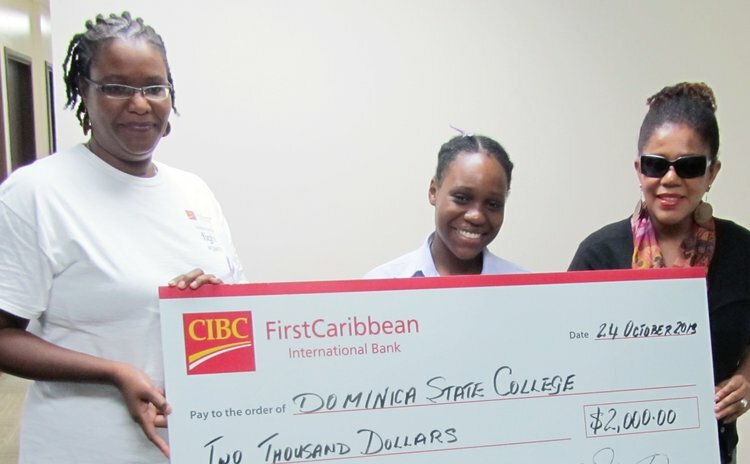 A student of the Dominica State College Dinah Pendengue will find it easier to continue her studies at the college thanks to an EC$2000 Scholarship from the CIBC FirstCaribbean International Bank. Rhona Lawrence Business Support Officer of the bank presented the check to the Bursar of the College Catherine Abraham stating that it has been the result of a two year partnership with the College and that the bank is pleased to be able to support a young person in realizing their dream of pursuing tertiary education. Abraham applauded the bank for recognizing a student in the field of entrepreneurship since the college she said was attempting to steer students away from the traditional core subjects and to do things that were creative and innovative so as to create jobs for themselves and others and not depend on the public or private sectors. She added that the scholarship was awarded according to the bank's criteria of performance and need. The scholarship recipient thanked the bank for the scholarship and promised that the investment will not be wasted.